Winter 2018 Appearances – Rich Pawling's History Alive! Have you ever thought about the cultural connections (language, customs, foodways, music, etc.) of baseball and agriculture? Many of the terms used in baseball past and present have an remarkable connection to farming and the land. So, are you ready to go back to the past to understand the present? When the milking is done, we’ll go out to that open pasture behind the barn where we play ball (ballfield). We’ll hit daisy cutters (line drives) and prove that even a rube (hayshaker) can hit an apple (ball) over the fence. As a feeder (pitcher), Asa has thrown many a hot potato through a barn door. Now, that’s baseball! 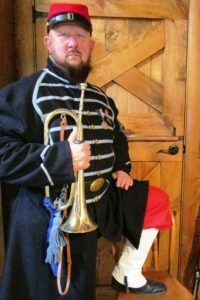 Rich will join the Long Hill String Band to provide Civil War era music for museum visitors on this Community Free Admission Day. Vocals will be accompanied by fiddle, banjo, mandolin, upright bass, and guitar as well as harmonica, cornet and bugle. Where else can you catch Rich over the winter? You may find him joining a great group of musicians for jams in various locations in the Berks/Lancaster county areas. Email us on our Contact page to check on specific locations & dates. © 2019 Rich Pawling's History Alive!.